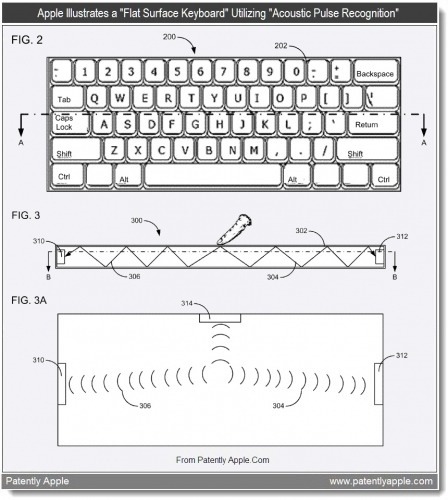 A recent patent filing by Apple reveals a new piezo-based acoustic and capacitive detection system which includes a glass based keyboard concept, reports PatentlyApple. The glass keyboard could have keys painted on the surface or provided as graphics on a display below the surface. Haptic or tacile feedback could be provided via vibration or motion to the user's fingers in response to a press on the surface. Apple describes the use of one or more piezo-electric sensors to detect and record an acoustic pulse created when the user taps on the keyboard. In the example shown in FIG. 3, two piezo-electric ("piezo") sensors 310, 312 are arranged within the keyboard structure with one on the left sidewall of the keyboard structure and the other on the right sidewall of the structure. The piezo sensors are situated to receive an acoustic pulse created when the user taps a segment or segments of the top surface of the keyboard. Apple's patent FIG. 3A depicts a cross-sectional top view of the keyboard of FIG. 3 along line "BB" that utilizes three piezo sensors 310-314 to detect an acoustic pulse recognition of a tap on the keyboard surface. During operation, a user taps on the surface of the flat keyboard defined by the keyboard outline. For example, the user may tap on the top surface of the flat keyboard (302) that includes an indication of the letter "H". When tapped, one or more acoustic pulses 304, 306 propagates away from and along the keyboard's top surface. Recently, another Apple patent filing detailed the use of proximity sensors to determine when your finger gets close to a key, causing air to shoot out from the key towards your finger to provide tactile feedback. Why not just use a led backlit LCD touch panel on the bottom part of the laptop and allow it to hide the keyboard similar to the iPad and instead of the keyboard it will show the dock in fullscreen apps.